House Democrats have gone on record demanding American taxpayers pay reparations to illegal aliens who have been arrested after illegally crossing the border. Rep. Pramila Jayapal appeared on MSNBC to talk about her interaction with Acting Attorney General Matthew Whitaker during a House Judiciary hearing, where she asked him about family separations. 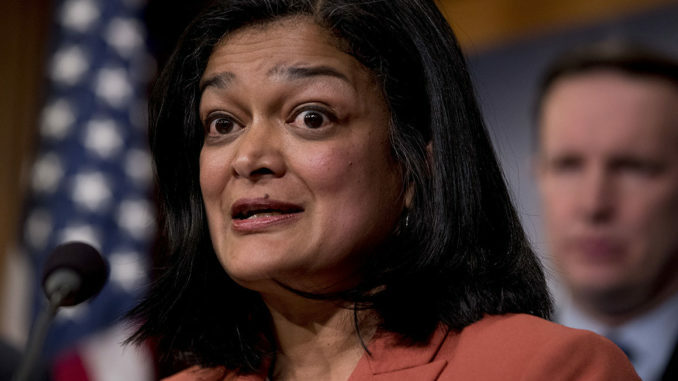 According to Jayapal, those who violate the law to illegally enter the United States should be given special treatment at the expense of the American taxpayer. Rep. Joe Crowley (D-N.Y.) also believes illegal immigrants should receive reparations for their treatment after illegally crossing the U.S. border — since children were separated from lawbreaking adults, as is customary in the U.S. Despite the fact the policy was in place during the Obama era, Rep. Crowley tried to blame President Trump, claiming it is the most “reprehensible thing” he has witnessed in his 20 years in the House. “To have these children depart, separated, is one of the most reprehensible things I’ve ever witnessed in my 20 years of service here in the House of Representatives,” Crowley said on Wednesday. Apparently Rep. Crowley wasn’t paying attention during the Obama years. But like all Democrats, that doesn’t stop him blaming Trump for everything. Last month, socialist Democrat Alexandra Ocasio-Cortez said Latinos should be exempt from following immigration laws. Now the Democrats want American taxpayers to pay reparations to illegal immigrants who have broken US law. This is actually something many Communists believe. America is responsible for third world nations being crap holes, and so we should pay them to make up for it. Of course, in reality its just another pathetic attempt at Marxist wealth redistribution. American society must not reward law breakers. If we reward criminality, we will only encourage more of it.